"How to Build a Poolside Cabana, from Beautiful Pool House Designs"
Whether you are looking for custom or stock pool house floor plans, If you are a do-it-yourselfer interested in building a poolside cabana, there are resources available to help you determine your needs. Pool house designs can vary according to price, size and features. A good pool cabana will be designed with a change room, shower, washroom and pool equipment storage area. Some pool house blueprints also contain an area for a sauna, a kitchenette, and even an outside pool bar. An excellent way to enhance the overall look of your property is to choose a pool house design that compliments the look of your residence. Another way to get pool house designs, which are customized to your wants and needs, is to use a CAD drafting service. Here at iCadTec.com, we can take your pool house ideas and concepts and turn them into a professional set of working drawings, necessary to obtain a building permit and are do-it-yourself and contractor friendly. Simply send us your pool house floor plans ideas, of what you have in mind for your poolside cabana, and we will work with you to develop your dream pool house. We will create all the necessary pool house construction plans and documents, such as: pool house plans, elevations, sections, details, roof plan and a site plan. For more ideas you may want to consider consulting the "Pool and Garden House Plans" catalogue that contains 58 different styles of pool house plans, designed by registered architects. The 128 page book is filled with beautifully rendered pool and garden house exterior views, as well as relevant floor plans. 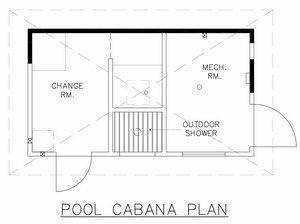 Each pool house plan displays the well designed cabana layouts and facilities. This book can help you choose a pool house design that fits your style and budget. There is a form at the back of the book that can be filled out to order the exact set of construction plans required to build each pool house or garden house.